“The Secretary-General extends his heartfelt condolences to the families of the victims, the Government and people of the United Republic of Tanzania and wishes the injured a speedy recovery,” Mr. Dujarric added. 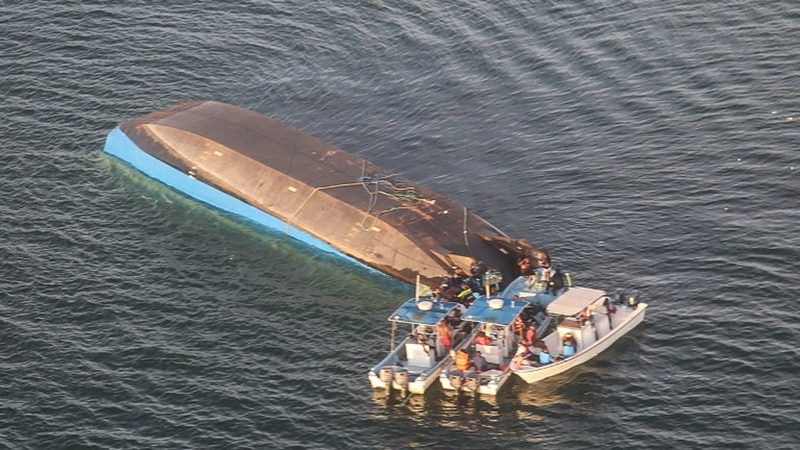 Officials believe that the ferry was carrying more than 400 passengers at the time of the capsizing, approximately four times the reported maximum capacity of the vessel. Hopes of finding more survivors were virtually nil. It’s obvious that more bodies are trapped in the capsized vessel,” Tanzanian newspaper The Citizen quoted the Tanzania president as saying. “The United Nations expresses its solidarity with Tanzania during this difficult time and stands ready to support as required,” concluded the UN statement. President Magufuli warned against using the disaster for political gains. Tanzania’s opposition party accused the government of negligence. They said that concern was raided many times about the poor condition of this ferry, but the government turned a deaf ear. The ferry was running its route from Bugolora to Ukara allegedly more than 400 passengers aboard, in addition to a cargo of maize, bananas, and cement. It went down in the afternoon, a few meters from the dock of its intended destination of Bwisya. Eyewitnesses claimed the incident occurred due to passengers surging forward to disembark which, together with a car being pushed, caused the ferry to list to one side and capsize. Newer PostTourism Challenges in Africa: Red Rocks Initiative may become a key force for the better?